A.J. 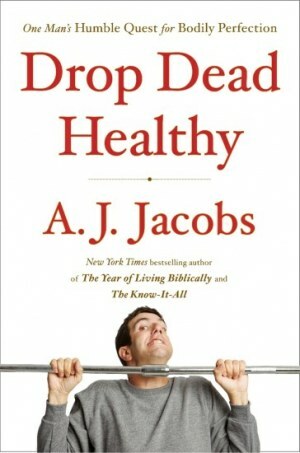 Jacobs' Drop Dead Healthy is the second book I've reviewed this year involving quackery, self-experimentation and self-deprecating humour (the first was Dr. Tim Caulfield's fantastic The Cure for Everything), and Jacobs' doesn't disappoint. Like Caulfield, Jacobs chronicles his 2+ year long series of personal experiments with which he aims to become "the healthiest man in the world". 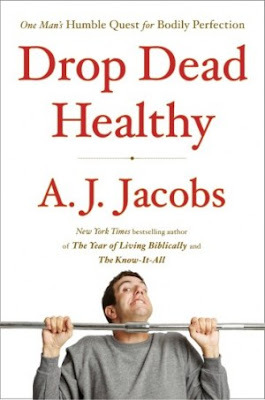 Rather than tackle broad subjects like "diet", and "fitness", Jacobs takes a system by system approach to detailing his efforts at improving most of his big ticket bodily functions. Among many other things he tries paleo diets and raw veganism, he wears noise cancelling headphones around the home, he exercises half naked in parks, orders an add-on for his toilet so that he can squat rather than sit, creates aphrodisiacs out of cucumber and Good & Plenty candies, and runs his first triathlon. "It's a bizarre situation. It's like owning a home for forty-one years and being unaware of the most basic information, such as how to work the kitchen sink. Or where to find the kitchen sink. Or what this so-called kitchen is." Where Jacobs' and Caulfield's books differ I think may reflect their respective starting points. Jacobs is a best selling author, editor and columnist. Caulfield is an academic professor. And while Caulfield's book is certainly not written in an academic style, and is hugely entertaining, Caulfield heartily and thoroughly tackles the science behind the quackery as well as its potential societal impact whereas Jacobs spends less time on the why and more on the what, and while he rightly dismisses much of what he experiments as likely nonsense, he doesn't dwell on the impact that nonsense might have on the folks who may not take the time he took to try to understand its whys and wherefores. Central to the humour in Jacobs' book is his long-suffering wife Julie. I write long-suffering not because I think she's suffering at all, but more because I'm guessing her sense of humour will appreciate it. She's a wonderful foil for her husband's misadventures and how I wish I could have been a fly on their wall following their "intenSati" experience. What I love most about Jacobs' book is how well I think it resonates with my own personal and professional healthy living philosophy - live the healthiest life that you can enjoy. What I'm getting at is while his 2 year adventure chronicles his trying to live the healthiest life he could tolerate, his plans now are to downgrade those efforts into the healthiest life that he can enjoy, which in my clinical experience means that he's got a great shot of maintaining real, long lasting change. Drop Dead Healthy was definitely a great read. [Here's an Amazon Associates link to the US Amazon listing of Drop Dead Healthy.